Have you ever watched a baseball game and noticed how many times a batter is retired by called-strikes? 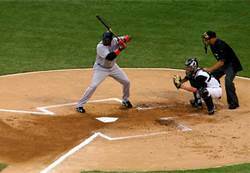 A called-strike occurs when the pitcher throws the ball within the strike-zone, but the batter refuses to swing at it! I have watched games in which some batters watched three good pitches go by without ever attempting to lift the bat from their shoulders! Now I know that, in the game of baseball, the batter is trained to wait for certain pitches. But it seems to be a shame to me that, all too often, the batter is defeated by default while he is waiting on the “right” pitch! Well, many people live their lives in the same manner! They are constantly defeated by default! Some times it is because they have had so many failures in the past that the desire to compete is no longer present. They are like the blues singer I heard singing, he moaned: “I’ve been down so long that getting up don’t even cross my mind!” Some times they are just waiting for the “right pitch” (the perfect opportunity) and are afraid to swing at something they are not completely sure of. But whatever the case, they allow many of life’s opportunities to past them by without even making an attempt! So many times success would be a real possibility, if they only took a swing at it! But, they are held captive by their past casualties and/or are fooled by the false belief that everything must be exactly just right before they give it a try! They are waiting for all the traffic lights to turn green before they pull out of the driveway! But my friend, no matter how many times you have been to the plate of life and struck out, I want to encourage you to give it another try! You might surprise yourself with a hit! By the way, in the game of baseball, did you know that if you are a .300 hitter, you are considered to be good? Just think about that for a moment! A good hitter in baseball only gets about three (3) hits out of ten! The best hitters in baseball miss the ball more times than they hit it! Babe Ruth once held the record for the most hits and home-runs, but he also held the record for the most strike-outs! Life will throw you some curves and many times you will strike out! In fact, more than likely, you will taste defeat more often than you taste victory. But, defeat is not really defeat if you learn something from the experience. Don’t let your defeats intimidate you to the point that you stop trying! Keep swinging the bat! Weight your options; calculate the risks and rewards. Then, when the pitch (the opportunity) comes; give it a swing! You may strike out, but at least you would have given it a try! If you keep swinging long enough and hard enough, sooner or later, you are bound to get a hit and it might even be a home run! But you will never know, if you never lift the bat from your shoulders! You will never get a hit if you never take a swing! And those who never swing at the ball or take risks in life always end up defeated by default! This entry was posted in Inspirational Thoughts and tagged Baseball, Batting (baseball), failure, game of life, Hit (baseball), Strike zone, strike-out, success. Bookmark the permalink.